Jim Schwartz was a baller on Saturday. With 1:05 left in the fourth quarter, a five-point deficit, and facing a 4th and goal from the two-yard line, the Atlanta Falcons had one play to either extend their season further into the playoffs, or go home. They went home, due to the preparation of the Philadelphia Eagles' defense, led by Jim Schwartz and safety Rodney McLeod. If you'll notice the formation, there's a tight end on the line of scrimmage to the play side of the field. His role is to provide added protection for the sprint out to that side. There are also two wide receivers to the play side of the field, with the outside receiver, Jones, again, running the comeback. The Falcons showed that look inside the 10-yard line twice this season; once against the Lions, and once against the Saints. Against the Lions, the Falcons ran a sprint out, out of a very similar formation to the left side of the field, and they scored, though it was wasn't the same exact route combination as above. Against the Saints, the Falcons completed the pass, but where stopped juuuust outside the goal line. This is the same exact play the Falcons ran against the Eagles. Safety Rodney McLeod (23) read the play all the way. Pre-snap, when Falcons tight end Levine Toilolo (80) motioned from the left side of the formation to the right, where the Falcons had dual wide receivers, you see can McLeod recognize the play immediately, at which point he communicated it with Malcolm Jenkins in the slot and Jalen Mills on the outside. McLeod then barked instructions to Nigel Bradham to rush the quarterback, knowing that his assignment, Toilolo, was likely just blocking on the play, and not a threat to head out into the pattern. Bradham would force the desperation throw from Ryan on the play. “I tried to tell Nigel to go down and pull it up because the tight end usually just blocks," said McLeod. "We needed an extra player over there, so I tried to tell him. He said he didn’t hear me and then he rushed, but he did a good job man and then obviously Jalen and Malcolm covering their guys up the way they did, and they played physical. "We ran it during our walk-through on Saturday. They like that play in the red zone, but also critical downs, like 3rd and short and 4th and short. As a corner, you have to be physical with 11. You know he's going to try to run at you, push off, so with Jalen, that's what he did. He was able to be physical with him, the refs allowed them to play, and he was there to make a play against a very good receiver in this league." Jenkins recognized the look they showed as well. "Jones breaks the huddle, comes to my side, and I told myself, 'I know where the ball is going,'" he said. "We got the ID motion (the tight end moving in motion from the left side to the right) that we got all week from practice and watching film both of the safeties called out the call, and communicated to everybody on the defense." 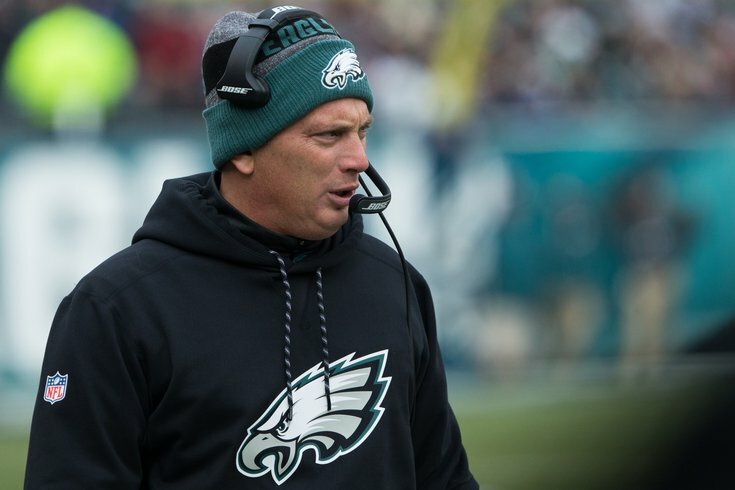 Eagles defensive coordinator Jim Schwartz deserves a ton of credit for having the Eagles' players prepared for that play the way that they were, and the Eagles' players deserve credit for recognizing it and executing. Outstanding.